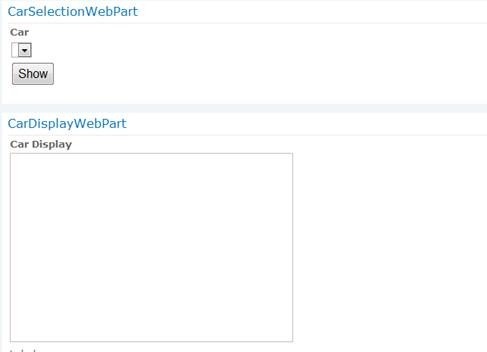 In this article we can explore Connected Web Parts which is an advance SharePoint Web Part feature. The connected web parts denote communication between 2 web parts. 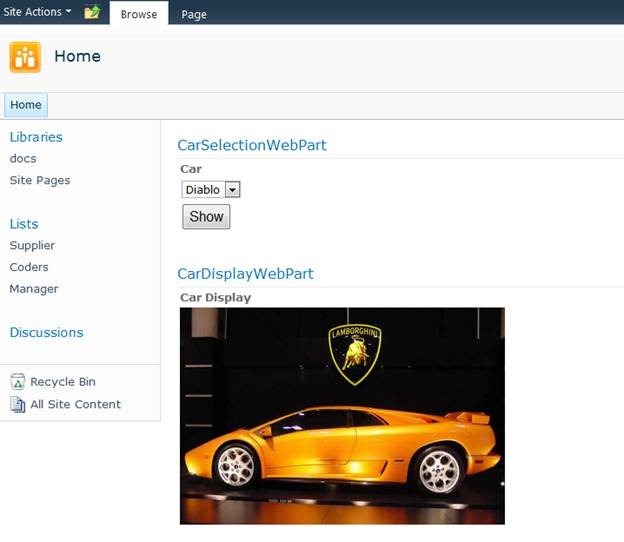 We can experiment with a Car showcase application where there are 2 web parts. · The first web part allows selecting a Car from the drop down list. · The second web part displays the image of the car. 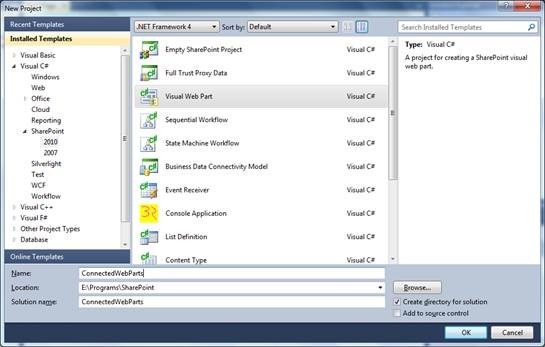 For starting with create a new Web Part project inside Visual Studio. Remove the default VisualWebPart1 web part. We will be adding our own web parts. The ConnectionProvider attribute and the interface of the method denotes that this web part provides data for ICar interface. The Connection Provider also says that the name is Car (in string). Now we can create the consumer web part which will get the selected Car to display the car picture. Add a new web part and name it as CarDisplayWebPart. Place an image control on the user control of the web part. Inside the class view of user control add the following method. Now build the project and use the Deploy command. Open the SharePoint site in edit mode and add the above 2 web parts into it. You are now ready with the following 2 web parts. 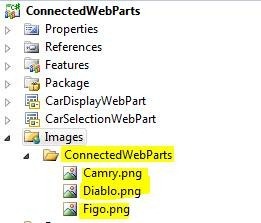 Use the context menu of CarDisplayWebPart to set the connection to provider web part. Now stop editing the web page and refresh the site. Select a car from the first web part and the car picture is displayed on the second web part. This concludes our article on Connected Web Parts creation. You can debug the application, by executing the project in Debug mode. Any break points set will get executed. In this article we have explored the Connected Web Parts feature of SharePoint Web Parts. In real world scenarios there could be multiple web parts communicating with each other through connected web parts. SharePoint also supports AJAX enabled web parts which provide a better communication between web parts. The attachment contains the source code of the web parts we discussed.